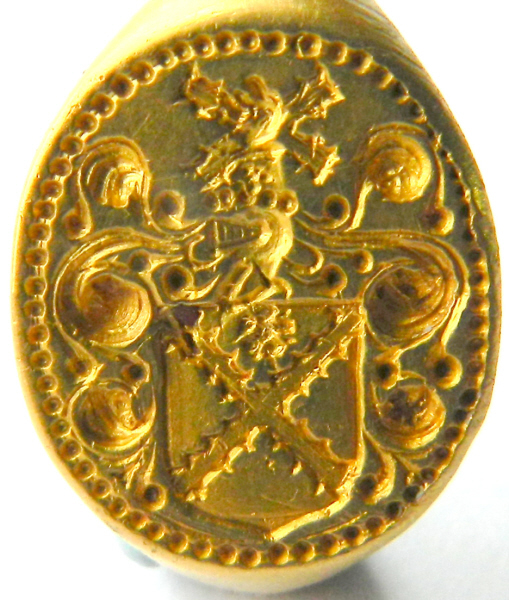 Last week I received a request from Roy Aldington about helping identifying a signet ring that was found on land in Bruen Stapleford, Cheshire. Dating the ring is also a challenge, Roy thinks it has a 16th or 17th century feel but a master engraver has suggested 13 century. Whatever the date it is a beautiful artifact. I have had no joy in finding any real clues to the owner’s identity. However, I do not feel too bad about that because the Lyon Court, the Heraldry Society and the College of Arms seem to be in the same boat. If anyone has any ideas, please feel free to join the search.